If one reads the current Cowells website (July 2009) they list a Jacot setup as an accessory to their lathe. Upon inquiry the setup is not currently available (and has not been for some time), current plans for future production may only include the drilling cone plate and no burnishing drums. It was stated that the setup is costly to produce and (perhaps due to the cost) has not had a good sales record. 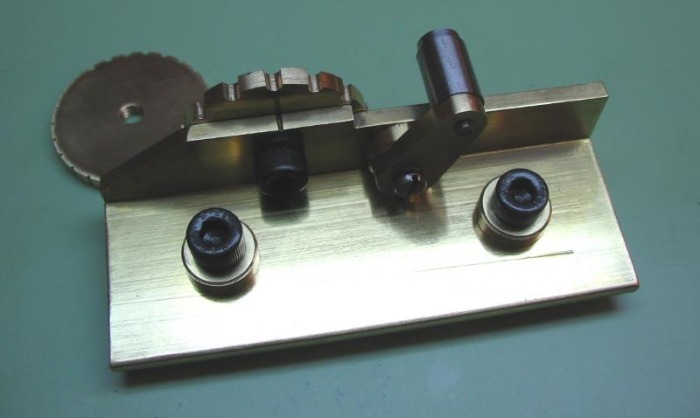 A Jacot setup is primarily a tool for the repairer, since pivots need to be re-burnished or repaired, and having a tool with ready available diameters of most pivot sizes can come in handy and expedite the process. 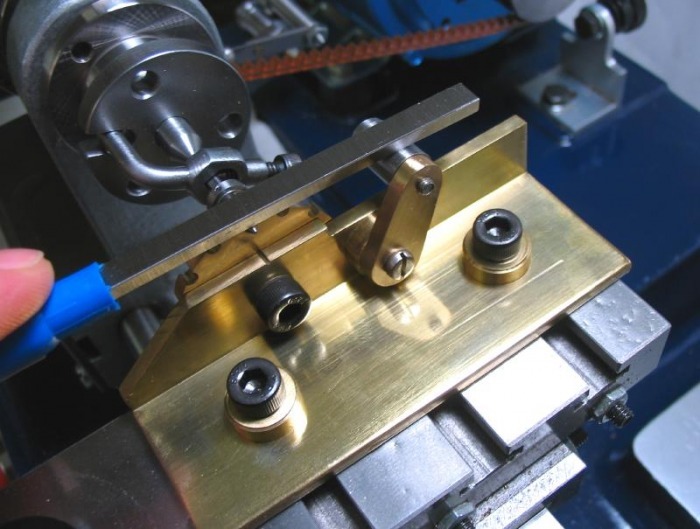 'Made for the occasion' burnishing beds can be made from brass rod in the tailstock. However, I wanted to take on a short project, and take a little break from the watch, and this seemed like a useful and fun project. After reading some of John Wilding's books, I was left with some ideas on how to make a Jacot setup. In three different books he demonstrates how to make a Jacot attachment for as many different lathes. In "How to Repair Antique Clocks" he demonstrates how to make a tailstock mounted Jacot for the Myford Super 7 lathe; in "Using the Small Lathe" he makes a cross slide mounted Jacot for the Toyo lathe; and in "Tools for the Clockmaker and Repairer" he makes a cross slide mounted Jacot for the Unimat 3. I chose this latter one as a model for making one for the Cowells 90CW. My design is more or less the same as his, I made mine a bit longer and was able to add an extra mounting screw (taking advantage of the longer cross slide and T-slots). I also converted the measurements to metric, including the hardware, since once one becomes familiar with metric units, working in fractions and in thousandths of an inch can be a bit confusing. Below is the most recent drawing of the components. The parts are fairly simple, and I will not go into the complete details of its construction. One can refer to the aforementioned book for complete instruction (see bibliography for additional details of those books). 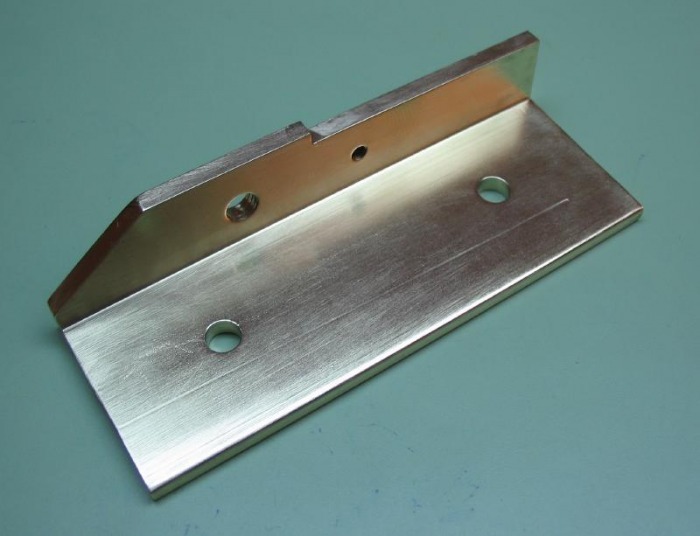 The mounting plate is made from angle-brass, 1.25" x 1.25" x 1/8". This may be hard to find, it took some searching, it was ultimately an Ebay find. It was made of type 385 brass, which was obviously a free machining type, since it cut with ease. I made use of the saw table to cut to length and trim the vertical dimensions, and cut the angle. 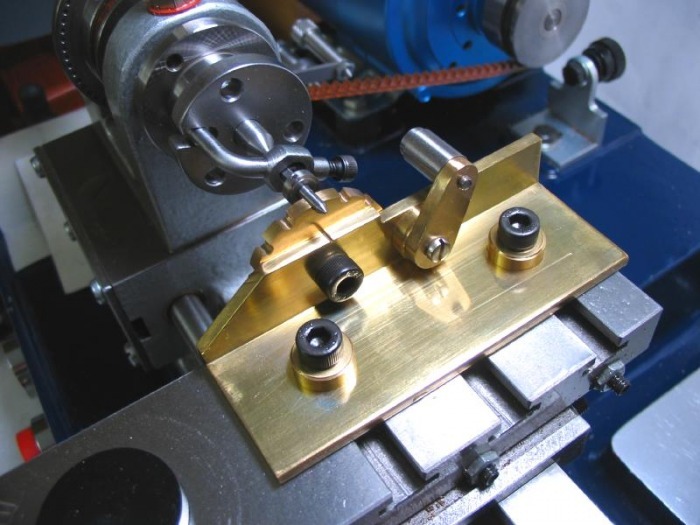 The vertical slide and milling vise were used to position and drill the required holes. A couple brass washers were turned and parted from brass rod to fit the mounting screws and under the guide arm bracket. The bracket was simply sawn from the scrap brass that was left over from the angle-bracket. The burnishing drums are cut from 1/8" Brass plate (Type 360). A center hole is tapped M5 and the rough disc is coated in layout blue and is mounted onto an arbor made for the occasion. The numerous hole positions can be scribed by indexing the headstock the required number of positions. The disc is then mounted onto the Jacot attachment. Once mounted, the lathe center position can be scribed onto the drum disc with the headstock center. The scribed intersections are the locations for the various drillings. After drilling, the disc is mounted back onto the arbor and turned to the scribed diameter. I made two discs with pivot diameters of 0.35mm to 1.55mm ( in 0.05mm increments) and 1.60mm to 3.00mm (in 0.10mm increments). The guide rest for the pivot file/burnisher is composed of a roller and a fixed arbor. The arbor screws into the bracket arm and has an extended shaft for the roller to bear upon. It was polished smooth and burnished to give a smooth action. Mr. Wilding recommended mild steel, however, I used drill rod and left them in the annealed condition. Shown is the finished setup mounted onto the cross slide, shown in use with a burnisher, and a photo with the second drum. Also shown is a dummy barrel arbor being burnished. Rotation is provided by a carrier plate with female center and a dog which clamps to the arbor.